Welcome to Chicago. 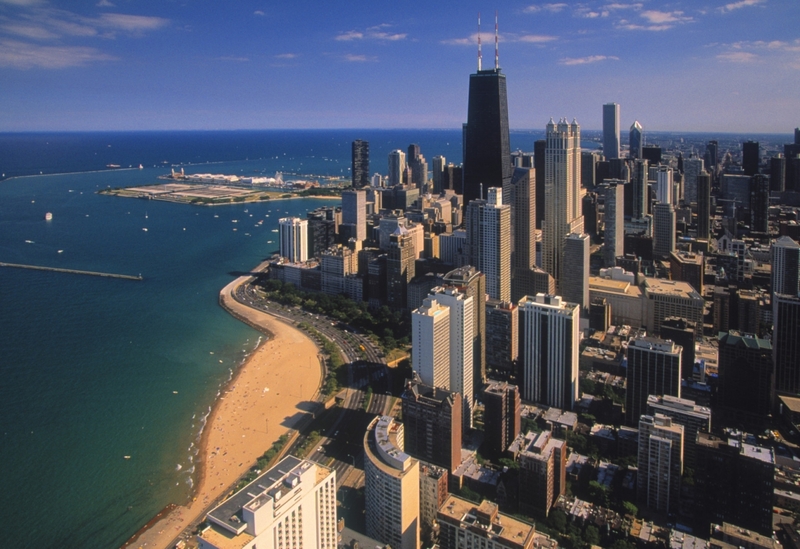 Among one of the largest cities in the U.S., Chicago’s unique blend of stunning architecture, attractions and local charm makes it an unforgettable destination. Uponarrival, transfer independently to your hotel where you will meet your ATI Tour Director. A comprehensive city tour starts the day. The remainder of the day is at leisure allowing you to explore your choice of Chicago’s must-see attractions at your own pace. Visit the second tallest building in North America, Willis Tower, where you can step out onto The Ledge and stare 1,353 feet straight down. Check out incredible panoramas from 360 CHICAGO, formerly known as the John Hancock Observatory. See mind-bending reflections of the city skyline at “the “Bean” (Cloud Gate), the centerpiece of Millennium Park. Stroll around Buckingham Fountain and enjoy the colorful light and music display as it glows against the skyline and lakefront, or indulge in some cheesy goodness at one of Chicago’s famous pizzerias that serve up award-winning deep-dish pizza. 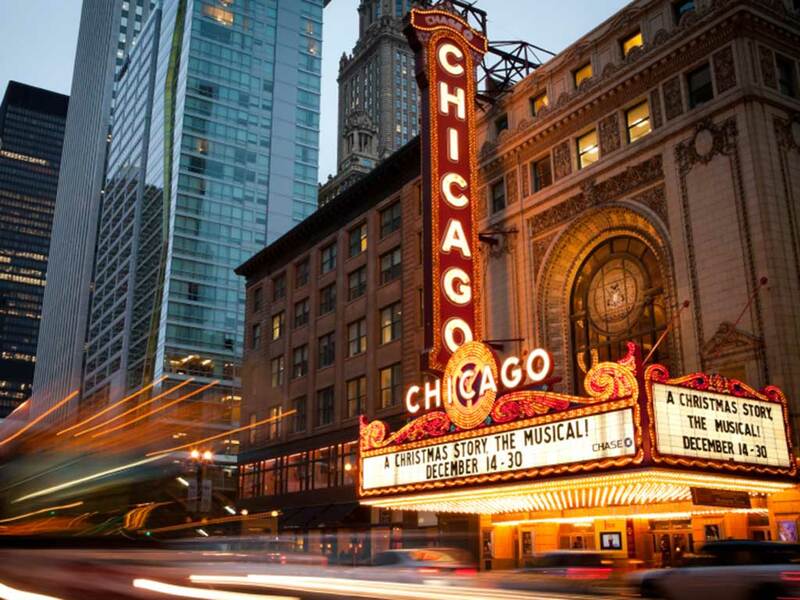 Whatever you choose, the Windy City will blow you away with the sheer number of things to see and do. This evening, join your fellow travelers for a welcome dinner and some soulful sounds at a legendary jazz or blues club. Heading diagonally across the state of Illinois, you’ll cruise through endless fields of corn en route to Springfield. The iconic heart of America, capital of Illinois and hometown of Abraham Lincoln, Springfield is filled with authentic experiences and nostalgia for days gone by as Route 66 runs right through it. Continue to St. Louis, the Gateway to the West. Upon arrival, glimpse the nation’s tallest monument, the Gateway Arch, which commemorates Thomas Jefferson’s vision and St. Louis’ role in the westward expansion of the United States. This morning, it’s on to Southern hospitality, unbelievable cuisine, a boundless spectrum of nightlife, and an unforgettable experience in Music City – Nashville, Tennessee. From its very beginnings, Nashville grew from a foundation built on music. It’s the common thread that connects the life and soul of the city and its people. This evening, experience for yourself what makes Nashville special with a live show at the Grand Ole Opry, the “home of American music” and “country’s most famous stage.” (optional). Today it’s time to get out and play the Music City way. A full day at leisure to explore Nashville’s must-see attractions at your own pace. Follow the story of country music, past to present, through the Country Music Hall of Fame. Visit Historic RCA Studio B, “The Home of 1,000 Hits” (optional). See the world’s only full-scale reproduction of the famous Greek temple, Nashville’s Parthenon. Step on the stage that attracted so many greats at the Ryman Auditorium, or back in history and explore the grounds and more at Andrew Jackson’s Hermitage, home of the people’s President. This evening you may want to enjoy Nashville’s Honky Tonks, a creative breeding ground for hopeful performers, musicians and songwriters yearning to make it big. Next to the Birthplace of Rock ‘n’ Roll and the starting point of soul and blues – Memphis. Located on the bluffs overlooking the mighty Mississippi River, Tennessee’s largest city,is known for its finger-lickin’ barbecue, live music and world-famous attractions. 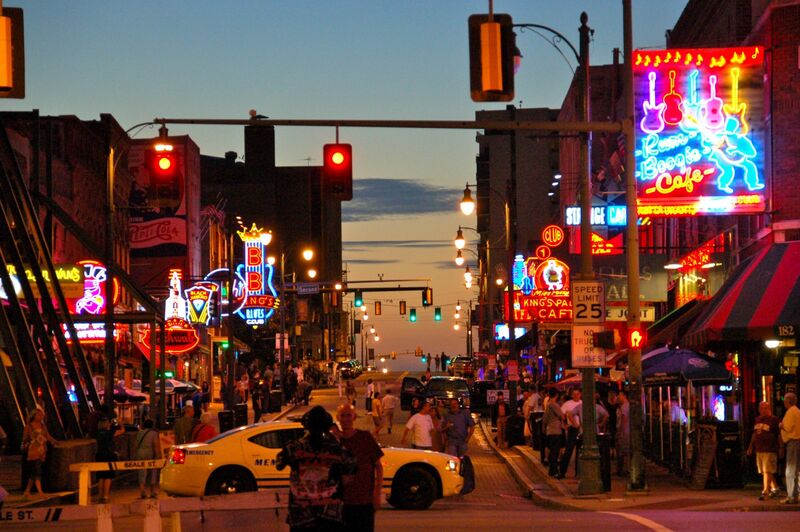 You’ll get an authentic look at Memphis and its music as you tour Beale Street. Here, live music spills from each club, history hangs in the air, and from the moment your feet touch the cobblestones you’ll realize you’ve entered a music mecca unlike any other. And, as no visit would be complete without walking in the footsteps of the King of Rock and Roll, you’ll enjoy an unforgettable journey into the private world of Elvis Presley at Graceland Mansion. Leisure time today to explore more of Memphis at your own pace. Consider a self-guided tour of the National Civil Rights Museum, the site of the assassination of Dr. Martin Luther King, Jr., watching the Peabody Hotel’s famed duck march, or a guided tour through Sun Studio where you can learn the story of the studio that launched many musical careers. 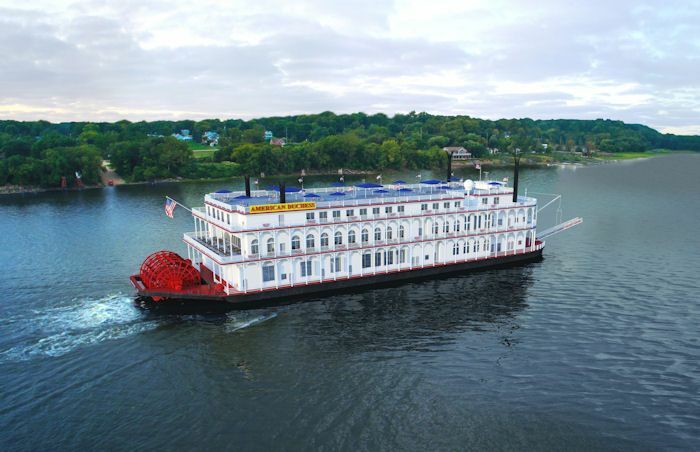 Leave land for water as you board the grandest riverboat afl the American Queen. This beautiful lady of the river epitomizes the grace and grandeur that has made river cruising a cherished American tradition for more than two centuries. Experience authentic Southern culture as you journey through living history along the Lower Mississippi. Greenville is at the very heart and soul of Mississippi Delta. 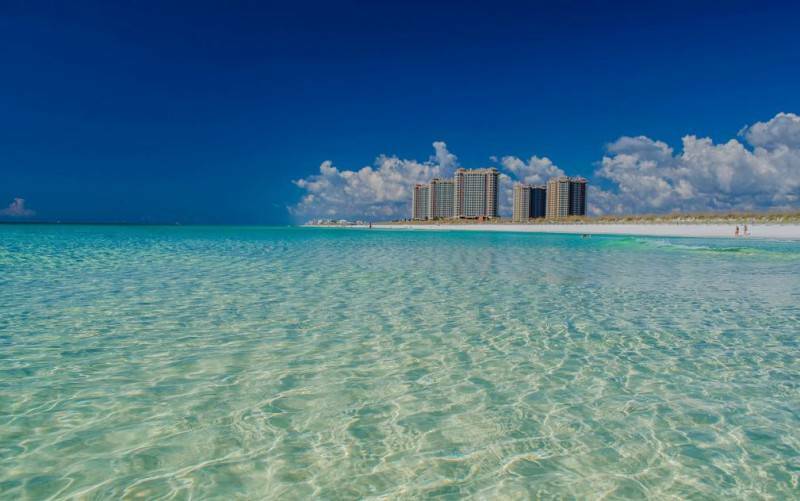 Located on the banks of Lake Fergusson, a short drive from Indianola, the birthplace of B.B. King and many other blues singers. Many authors and writers were born or reside in this small town. 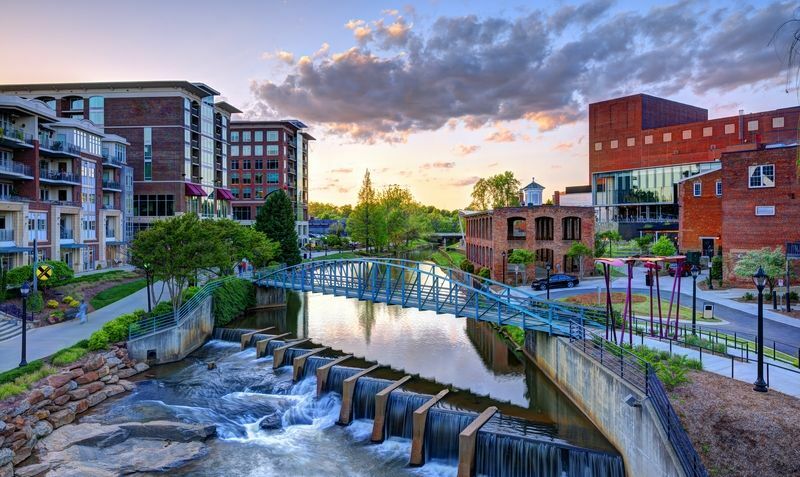 Also known for its museums, which the town has one for practically everything, Greenville is sure to win your heart with its southern charm and soul. Vicksburg perfectly blends Southern culture and heritage with exciting modern-day attractions. Described as the “Key to the South” by Abraham Lincoln, this Southern town carries a history unlike any other Civil War city. Founded in 1811, Vicksburg grew as a vital river port city. Today, Vicksburg is a popular spot for tourists to learn about the battles of the city, taste the cuisine, visit the many museums, and pick out the perfect souvenir. 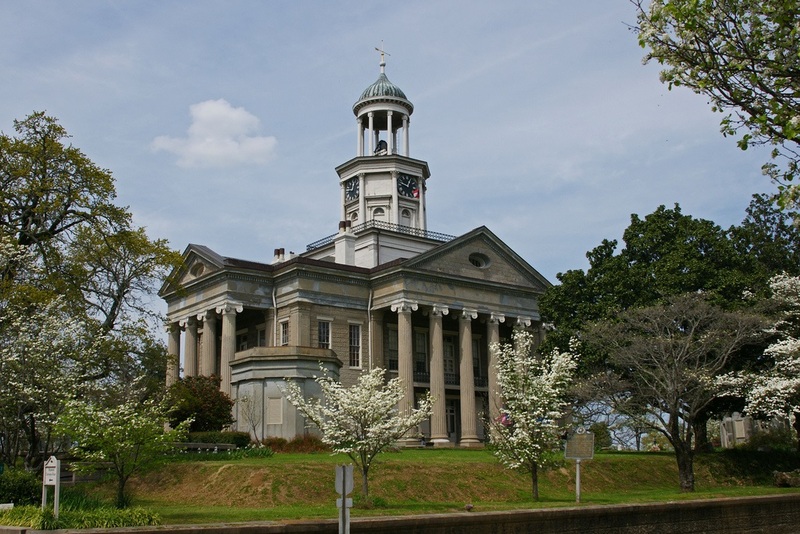 Established in 1809, St. Francisville is the oldest town in the Florida Parishes. In the 1790’s, below where St. Francisville is located today, was a settlement called Bayou Sara.When this settlement was destroyed by flooding and fires, many of the structures and artifacts were hauled up the bluff to St. Francisville where they still remain standing. Stop at one of the unique shops, historical homes, beautiful churches, or breathtaking parks and you will agree that St. Francisville has much to offer. Baton Rouge, the capital of Louisiana, has a deep culture and rich history. Named by French explorer Sieur D’Iberville, after a reddish pole marking two separate tribal hunting grounds, Baton Rouge has transformed into a rich cultural city. Home to Louisiana’s capitol building, the largest in the United States, as well as the Old State Capitol, a Gothic architectural monument located on the bluffs overlooking the Mighty Mississippi, visitors will enjoy spending the day exploring all that Baton Rouge has to offer. From museums and architecture, to shops and creole cuisine – everyone will enjoy an exciting day. Experience living history as you enjoy a guided walking tour of the largest remaining antebellum mansion of the Deep South, Nottoway Plantation. 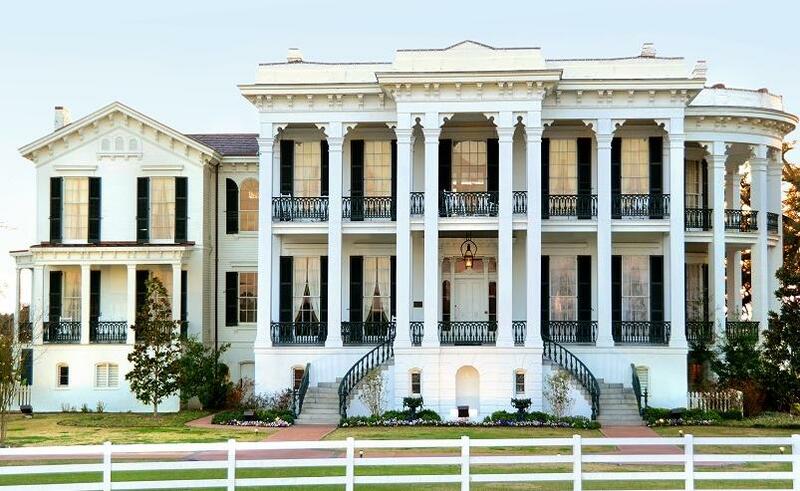 This stunning historical plantation lies between Baton Rouge and New Orleans and offers a glimpse into the truly grand Antebellum era. Nottoway’s mansion fl three fl 64 bedrooms, and displays an incredible 22 white square columns which contribute to its nickname – “The White Castle of Louisiana.” Rooms are trimmed in custom plaster frieze made from Spanish moss, clay, plaster and mud, and are all original to the house. And if that wasn’t enough, this immaculate mansion was constructed with 365 openings – one for each day of the year. Your tour concludes upon check-out from your hotel. If needed, ATI’s Tour Director can assist with securing transportation to the airport. - Taxi: Independent taxi service is available to transport passengers from the airport to their hotel. Approximate fare should not exceed USD $45 - $55, plus any toll charges that may apply. Passengers should secure rate before hiring. - Day 1 (Tuesday): Upon arrival, passengers should check-in at the front desk of the Doubletree Chicago - Magnificent Mile and identify themselves as participants of ATI’s Music & The Mighty Mississippi Tour. Passengers arriving between the hours of 2:00 pm and 8:00 pm should then proceed to ATI’s Hospitality Desk and check in with the ATI Tour Director. 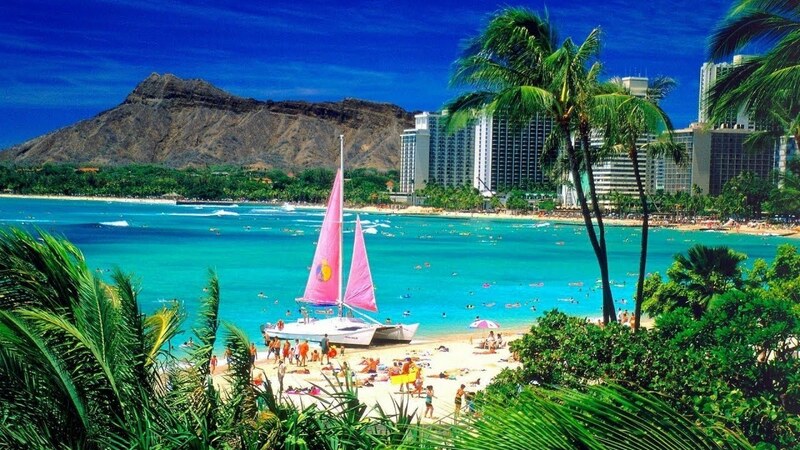 - Day 2 (Wednesday): Full day at leisure. If needed, ATI’s Tour Director can assist with securing optional tours. 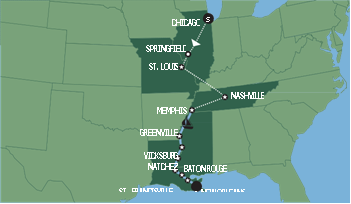 - Day 3 (Thursday): ATI’s Music & The Mighty Mississippi Tour departs for St. Louis at 8:00 am. Passengers should meet ATI’s Tour Director in the lobby of the Doubletree Chicago - Magnificent Mile with their luggage at 7:30 am. - Day 15 (Tuesday): ATI’s Music & The Mighty Mississippi Tour concludes upon check-out from the AC Hotel New Orleans French Quarter Area.